After not seeing much variety on the day before, I decided to head for Reifel Bird Sanctuary and join the Sunday morning bird walk. This is an informal tour of the sanctuary led by volunteer guides. I always take the back roads on the way to Reifel and was rewarded when a I spotted a small killer on the side of 34 St in rural Ladner. 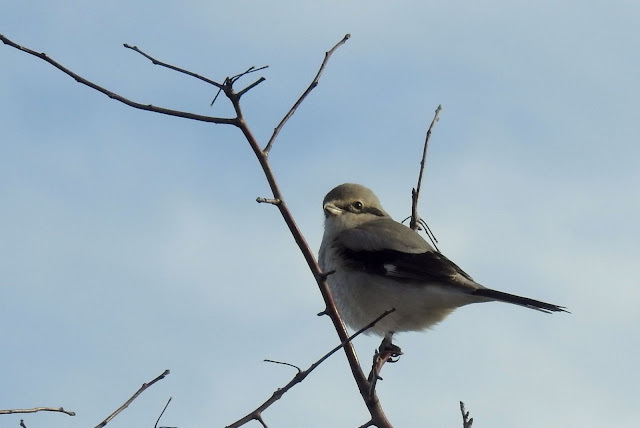 It was a Northern Shrike, a good bird to tick off on the year list. It did not mind my presence resulting in a few good photos. 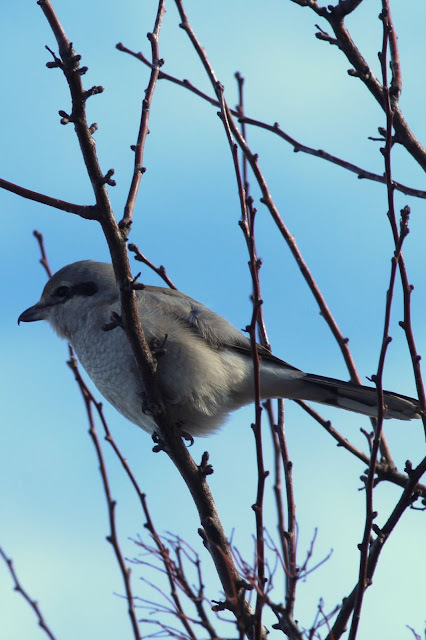 This photo shows the hook at the tip of its bill. I arrived around 10 at Reifel and was lucky to get a decent parking spot. With the good weather and the long weekend it gets very busy. The first place I checked was the pond beside the entrance. 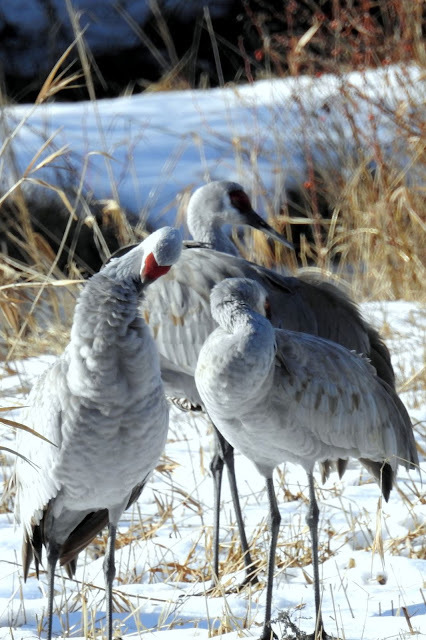 Across the way was a group of Sandhill Cranes. These birds are in a state of flux currently as the dominant male died in January. I believe it was over 30 years old. The remaining males are trying to sort out who's the boss now. I met up with the birding group and started out on the tour. 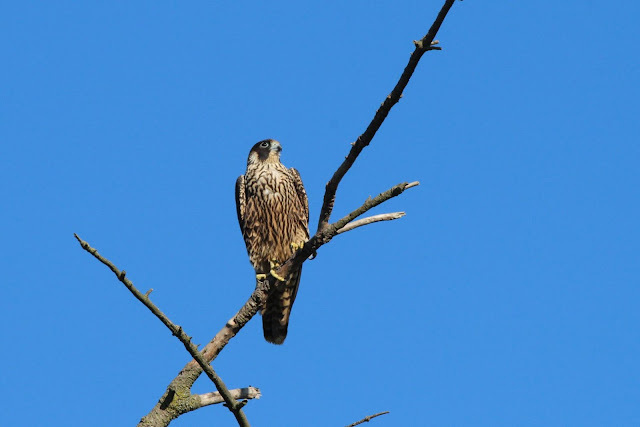 One of the first birds sighted was a very distant Peregrine Falcon. This was 017 Bird #63 for me. I got a good look through a spotting scope but it was too far for a photo. I'm substituting a photo I took in 2013 at Boundary Bay. 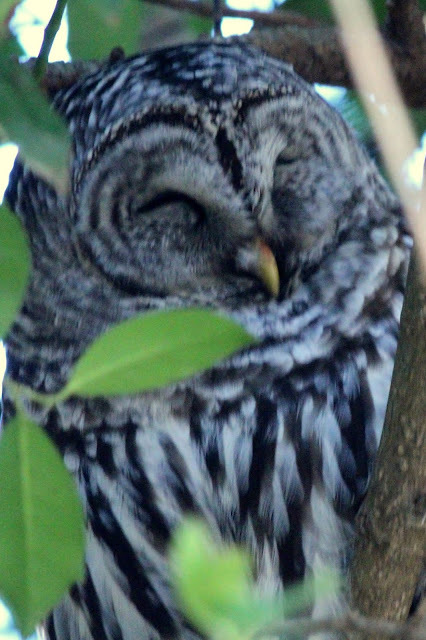 The group approached the North-west corner of the Sanctuary where the owls are normally seen. Someone on the trail told us there was a Barred Owl visible in that area. 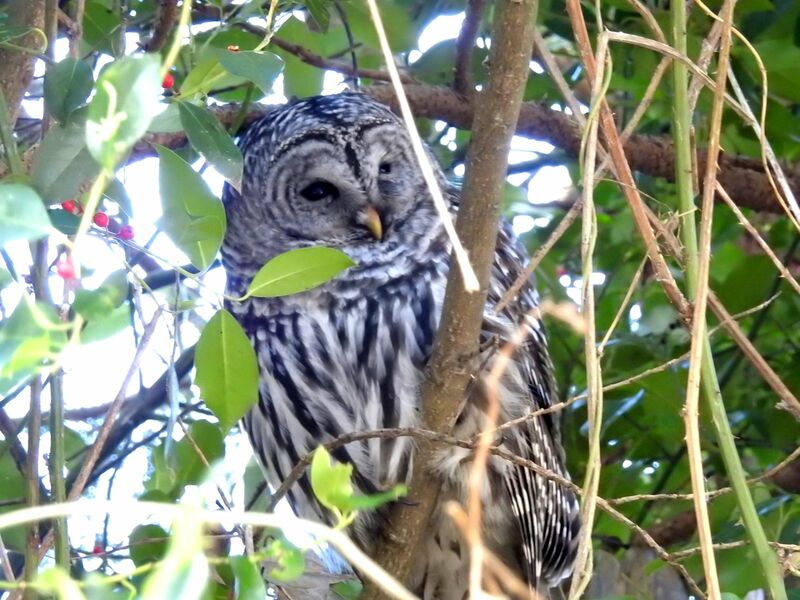 This meant the we'd be unlikely to see any of the smaller Northern Saw-whet Owls in the area, since they are prey for the bigger Barred Owl. When we reached the corner it was easy to locate the mid-sized Barred Owl. It was half asleep, but birefly woke up to check out the crowd that had approached its roosting site. After a brief look, it went back to sleep. 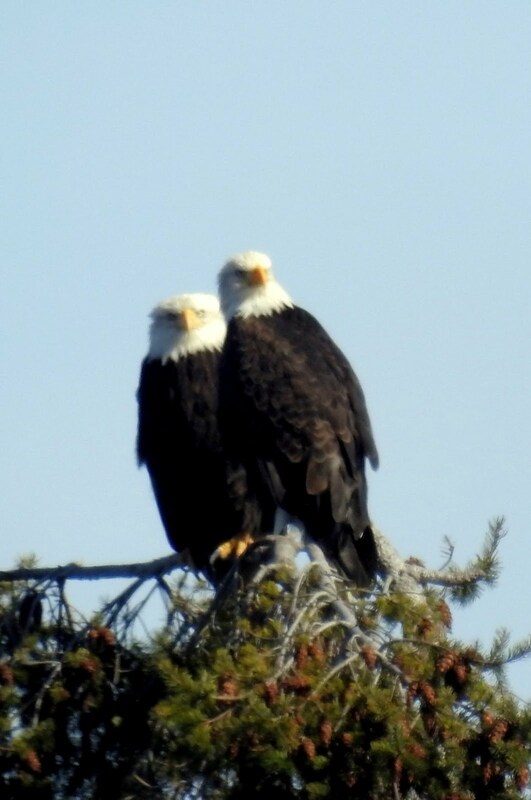 As we got out into the open, we spotted a pair of Bald Eagles in a tree. 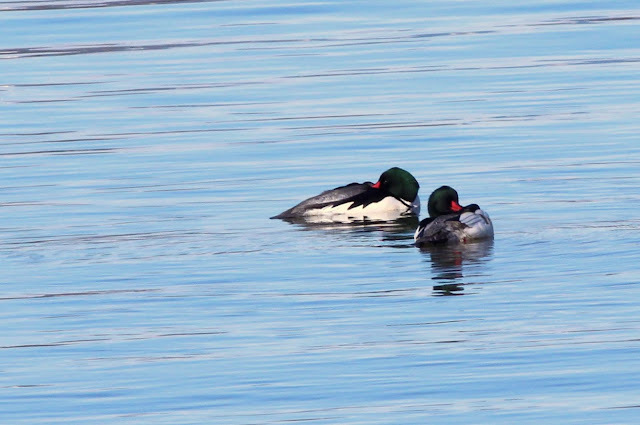 This appeared to be a mated pair. 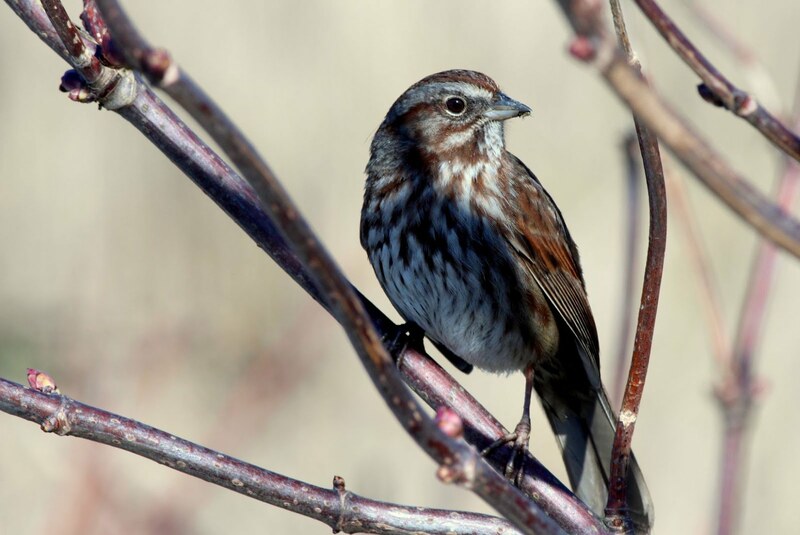 Further along the trail I got this shot of a Song Sparrow, probably the best shot of the day. I did see one more year bird before leaving, a Hooded Merganser. The photo was long distance and not worth putting here on the blog. It was 2017 Species #65. I did see the species a couple of weeks later and will show the photo in that post. 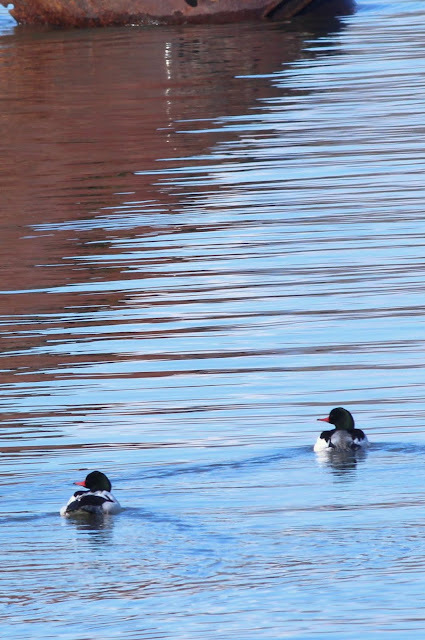 On my way home I took River Road along the Fraser River and stopped to take a couple of shots of some male Common Mergansers. It won't be long before the males disappear, leaving the females to deal with this year's ducklings. That wraps up day 2 of the Family Day long weekend, on day 3 I'd go falcon hunting.